As we begin recording for our second edition of the AYA Project, we want to take a second to highlight one of the most talented artists to grace our program: Kenny Automatic. Still 5 months from his High School graduation, Kenny was well versed in the Philly rap scene long before we got to know him. Writing since the age of 12 and recording since 14, he cites influence from family and close friends as inspiring him to pursue music and hone his craft. As a result, since his first performance to a crowd of almost 1,000 at Upper Darby High School, Kenny has made music part of the daily fabric of his life. On his song for AYA, “More,” Kenny gives listeners an up close look at his story, his struggle, and the steps to making his dreams become a reality. While most artists are quick to paint a picture rather than simply provide a photograph, “More,” is nothing but real from the first bar. 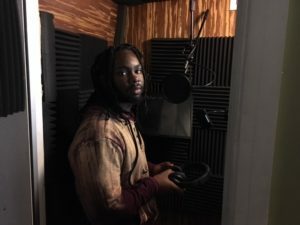 Working with guidance from another local favorite, Blizzy Trill, Kenny describes how this song allowed him to push himself out of his comfort zone and create a different sound. And as an artist already well-versed in multiple genres, this mentorship was an important part of furthering his development. “More,” will be hitting the Internet and the airwaves soon. Stay tuned for more AYA artists and watch for Kenny Automatic as his career continues to excel.